Microsoft To-Do is one of the latest apps to be included in Office 365. 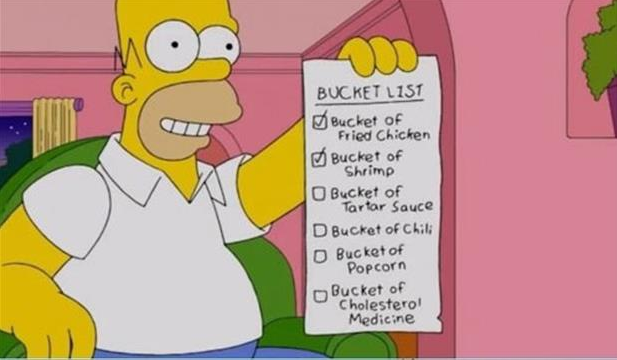 It’s a simple to-do list that makes it easy to plan your day. Whether it’s for work, school or home, To-Do will help you increase your productivity and decrease your stress levels. 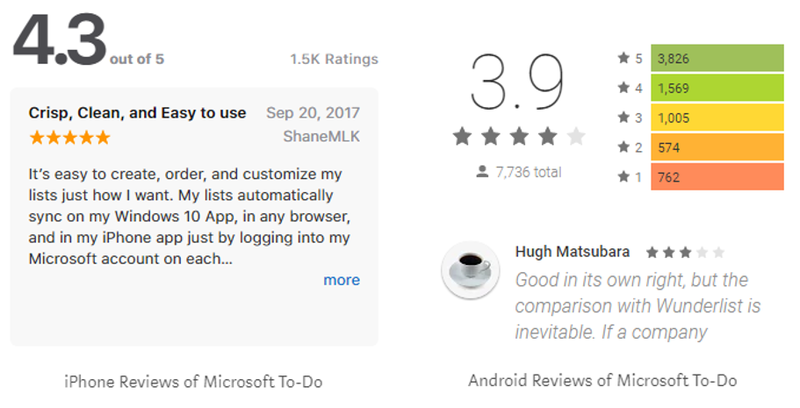 To-Do has a unique way to organize your tasks into lists, then combining those lists into a My Day view to clear the clutter and keep you organized. To-Do syncs with your phone and computer, so you can access your to-dos from anywhere in the world. You can quickly add, organize and schedule your to-dos while you’re on the go. Unfortunately, this latest addition to Office 365 is still in its infancy lacking many features we can expect shortly. Microsoft has stated To-Do will replace Wunderlist once To-Do has all the features of Wunderlist. For more information, take a look at my interview with Senior Product Manager of Microsoft To-Do, Simon Chan. David Allen is the master of to-do lists and has dedicated his life to helping people apply order to chaos and get more done. Every to-do app has two goals: improve productivity and relieve stress. 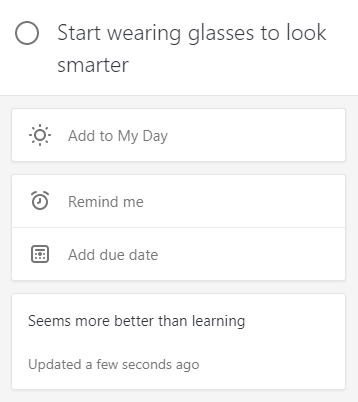 Microsoft To-Do has a flexible design. Create lists for longer tasks that need multiple steps and dump the rest into the ‘To-Do’ list. 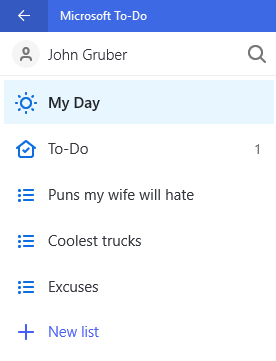 Microsoft To-Do has a unique design based on My Day. The My Day view is used to clear the clutter from your list of today’s actionable items. Start every day by reviewing your lists and moving priority tasks to the My Day list. 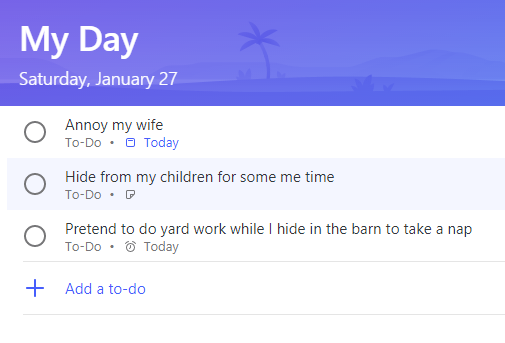 The My Day list is the heart of Microsoft To-Do and what makes it truly unique. It’s designed around clearing the clutter and prioritizing what’s important for the day. In Leonardo Da Vinci’s 500-year-old to-do list there were a ton of to-do items where he planned to ask others how things work. 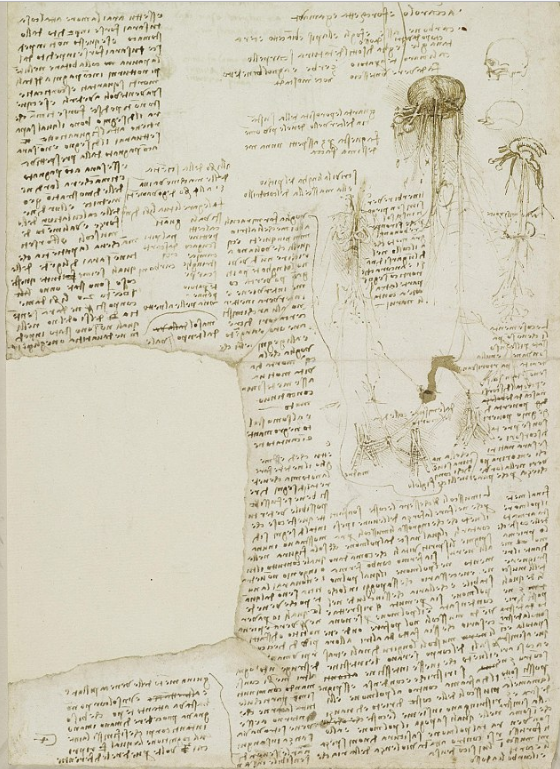 Leonardo’s relentless pursuit of knowledge is a lesson for us all. Unfortunately, Microsoft To-Do doesn’t have the ability to share tasks. Microsoft is pitching To-Do as the latest evolution of Wunderlist, as such, they have promised to add all of the features of Wunderlist. Sharing tasks with others is coming soon! Security & Compliance is where Microsoft To-Do stands apart. Under Satya’s leadership, Microsoft has been focused on the enterprise and that means security and compliance everywhere. Microsoft To-Do integrates directly into Outlook tasks so the security and compliance features of your Exchange Online mailbox are built right into the new app. We all have life goals. From getting more organized to finding more time to annoy our wives. Put all of these long-term goals in a list and review them daily, weekly, or monthly. When possible, create a to-do item to get yourself closer to your dreams. With the To-do app, you can create reoccurring reminders to help remind you to take small steps to making your life goals a reality. Folders — To organize lists. Sharing — To share a to-do list or task with others. Tags — To help organize across lists. Comments — To keep more complex tasks moving forward and organized. Integrations — To integrate with everything! To-Do has the Wunderlist team dedicated to its development and they’re adding features quickly. To-Do isn’t in the Office 365 Roadmap yet, but you can keep up using https://todo.uservoice.com/. Thank you for taking the time to read my article. I hope you found it beneficial. If you have any questions or feedback, please don’t hesitate to reach out.